Spectacular! Stunning! Beautiful! Mere words, even superlatives, fail to describe the amazing scenery of Iceland where I’ve just been exploring with a group of painters. Even the plague of midges brought on by the hot weather failed to dampen enthusiasm, and we managed a lot of sketching, often of some of the most sublime scenery you can imagine. The waterfalls of Dettifoss and Gulfoss will leave an awesome impression on us for the rest of our lives. 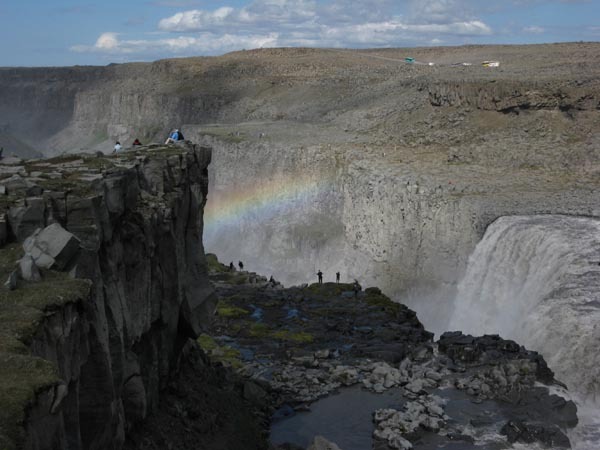 In this view of Dettifoss the figures will give you a sense of the vast scale of the canyon and waterfall. In the afternoon the waterfall appeared, coming from behind the crag and stopping abruptly in mid-air, in fact where the semi-transparent cloud of spray thrown up by the falls ends. In a painting this would look slightly odd, so I would extend it a little further to the right and gradually fade it out rather than stop abruptly. It adds a sense of drama as well as welcome colour. As it is soft-edged and semi-transparent I would lift out the shape of the rainbow from the backdrop and then paint in the rainbow colours onto a damp surface to encourage soft edges, but not having the paper so wet that the colours run into one another. This takes practice, but it’s great fun experimenting with the effect. If you really find it difficult in pure watercolour try applying watercolour pencils over the rainbow area once the paper has dried, but avoid laying them on too heavily as you need to suggest an airy effect. Then sweep a large round brush over the coloured pencil-work, applying the stroke in the curve of the rainbow. This will blend them together beautifully. You might like to try adding a rainbow to some of your existing watercolours – initially to paintings that perhaps have not quite worked out too well. See the excellent Derwent range of watercolour pencils for further information. This entry was posted in David Bellamy, Painting rainbow waterfall by David Bellamy. Bookmark the permalink. Hello David:) Wonderful how enthoustiastic you are! The photo is beautiful, but I’m sure you could make a terrific painting from it! thank you for the tips David – much appreciated, I’m a big fan of your paintings especially the Snowdonia mountains as I live in N. Wales and go walking there a lot, not got any on my wall het but plan to at some point! Espectacular paisaje y buen consejo y foto. ¿ Podría conseguir permiso del autor para intentar pintarla? Gracias y saludos. (Spectacular scenery and good advice and photo. Could you get permission from the author to try to paint it? Thanks and regards.) Tr. Google. No problem if you wish to paint from the photo. One day I’ll find time to do it myself. Thanks, I realized the watercolor. Best regards. Hi David. All I can say is wow. Seeing that rainbow got my tongue tied. Its magical.